If you've always dreamed of an outdoor wedding, there's a lot to plan. We asked Nikki Ford from outdoor wedding specialists Fiesta Fields for a checklist to help plan your magical day. There’s a lot to think about when you’re planning a wedding – and if you’re thinking of getting married in a field, there’s even more. 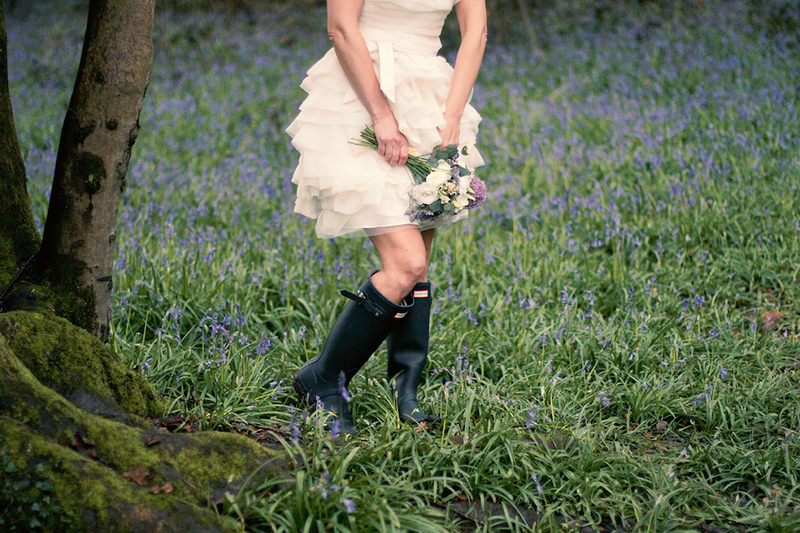 But not to be deterred, we asked Nikki Ford, founder of outdoor weddings and events company Fiesta Fields, to give us her ultimate checklist. When you start visiting fields always consider the following; is there good access for cars and larger set-up vehicles; is there a nice flat area for your marquee/tipis; is there a parking area away from your marquee (cars don’t look good in photos); ask how the land will be prepared (does it need rolling, will it be mowed? ); how many events will they host in one year? Some outdoor venues (not Fiesta Fields) charge commissions to your suppliers, so it’s worth finding this out upfront. Don’t forget to ask about rules of the venue, including amplified music curfews and finish time and whether things like fireworks, firepits and animals are allowed. 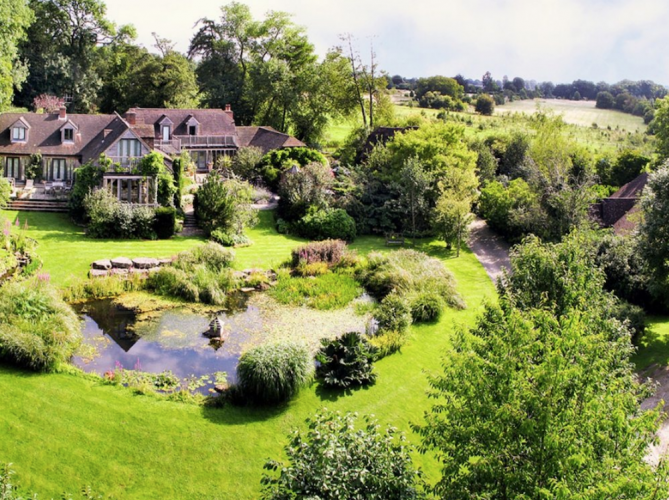 Fiesta Fields offer a beautiful collection of fields in Surrey and West Sussex. Consider taking out wedding insurance. (John Lewis offer a good policy). This is a bit of a no brainer, as in most cases the cost of the insurance will equate to the damage waiver on your tipi or marquee, plus you will have a host of other aspects insured as well. 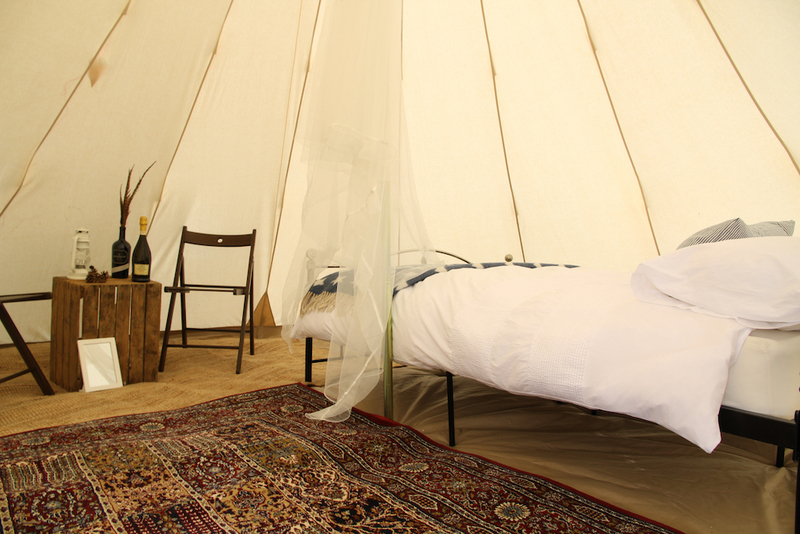 Just check in advance that your tipi/marquee supplier will remove the fee on receipt of your policy information. One of the big benefits of an outdoor wedding is no corkage or inflated drinks prices. You have two options with licensing laws: either hire a mobile bar or buy your own drinks. 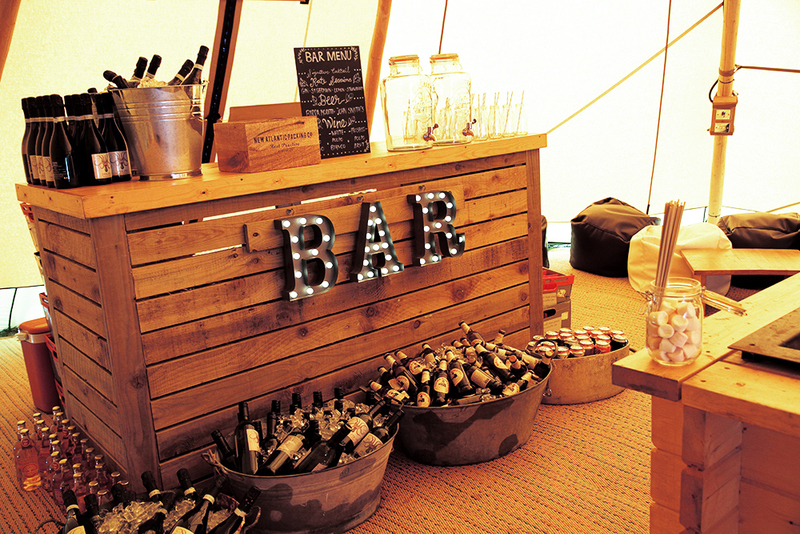 For the latter there are a few things to consider, such as disposables or glass hire (some venues will have a preference), and where you will keep the drinks (troughs of ice or something more creative like an old claw foot bath?) Consider hiring hospitality staff to serve, rotate drinks in the chillers and collect up empties. Always try and buy your alcohol on sale or return (booze cruise as an exception). It can be hard to gauge how much you will need and always best to overbuy, rather than under. Don’t underestimate the clear up the next day. Collecting empties and a trip to the bottle bank is a bump back down to earth after your magical day. If you can, ask good friends and family to do this. Also make sure you and your caterer/bar are clear on what they are responsible for clearing and if they’re taking their rubbish with them. If you go for glass hire, check how they want them returned, or you could find yourself rinsing 500 glasses as well. 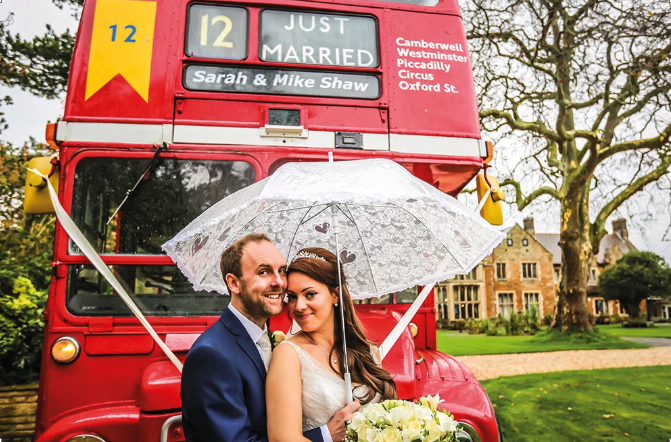 The good old British weather is a fickle thing and can play havoc with your stress levels in the lead up to your special day. Try not to watch the weather forecast too far in advance – it won’t be accurate and is an unnecessary emotional rollercoaster. Just make sure you have a wet and dry weather plan. For example, your ideal plan might be to have welcome drinks outside, but the back up plan is to have them on the dance floor. If you are unlucky and do have rain, embrace it. 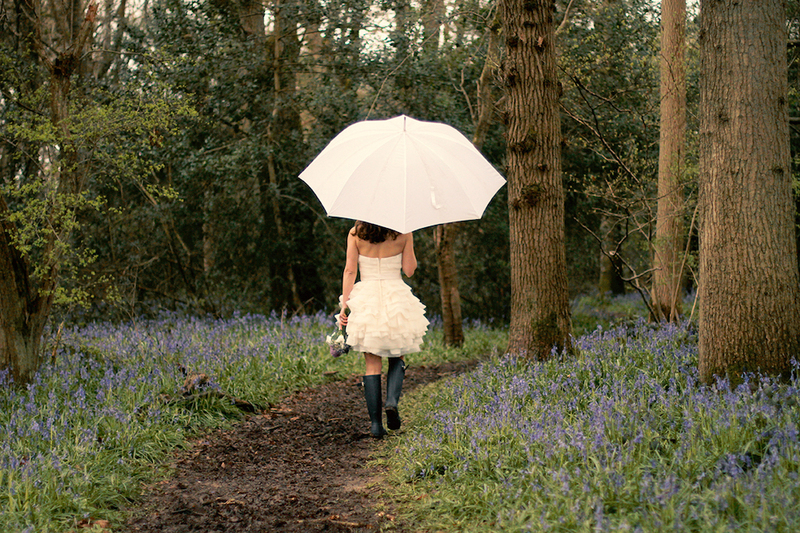 Have some funky umbrellas and wellies for back up (you can always return them if you don’t need them), and have a look online at some of the fab quirky wet weather photography and discuss this with your photographer. Draw a plan of how you would like to set up your space, both in your party tent and the outdoor space. Check with all suppliers on their electricity requirements and let your generator supplier know to ensure they supply the right size generator. They will also need your site plan, to work out where they should lay distribution leads and sockets. Think about your optimum layout in your marquee/tipi. It’s a nice idea to provide a chill out area away, from the dance floor, hay bales, deck chairs or picnic blankets outside. To maximise your space a few tables near the dance floor can easily be packed away to give you more room, especially if you have additional evening guests arriving. Think in advance about your lighting. Marquee and tipi suppliers will advise you on lighting in your marquee, which might be a mix of fairy lights, uplighters or festoons. Make sure you have dimmable options for when the party gets going. You can add in a mix of bamboo torches, candles, lanterns and firepits. Are there any trees or natural features you can light? 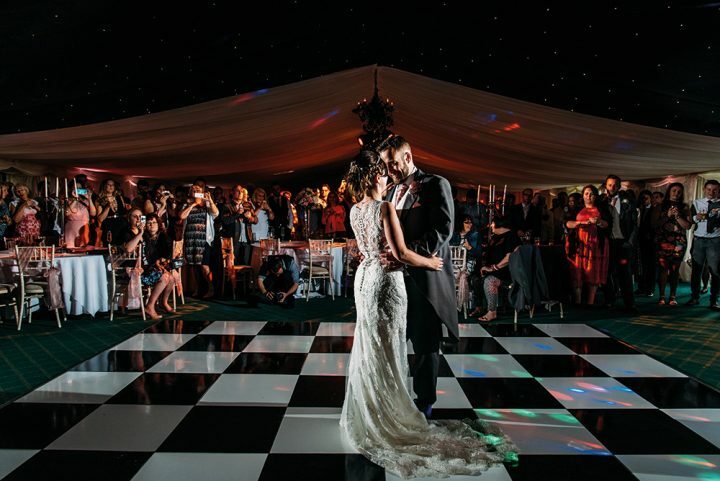 You’ll be surprised at how much light your marquee will throw on to your outdoor space, but make sure you light the way to your venue exit or the camping area. A great cost effective solution are to fill kilner jars with small strings of battery powered fairy lights, or battery powered candles in laser cut paper bags (remember to put sand in them to weigh them down). No matter how organised you are there will always be jobs to be done on the day; meeting suppliers as they arrive and letting them know where to set up; turning on the generator; meeting guests and letting them know where to park and set up camp; lifting and lowering the sides of the marquee; lighting candles, torches and the firepit and generally keeping the day on track. So either arm someone or a few people with specific tasks or consider hiring an on-the-day coordinator to take care of all this. If your location is in a remote area or on public land you should consider security services to keep an eye on things. 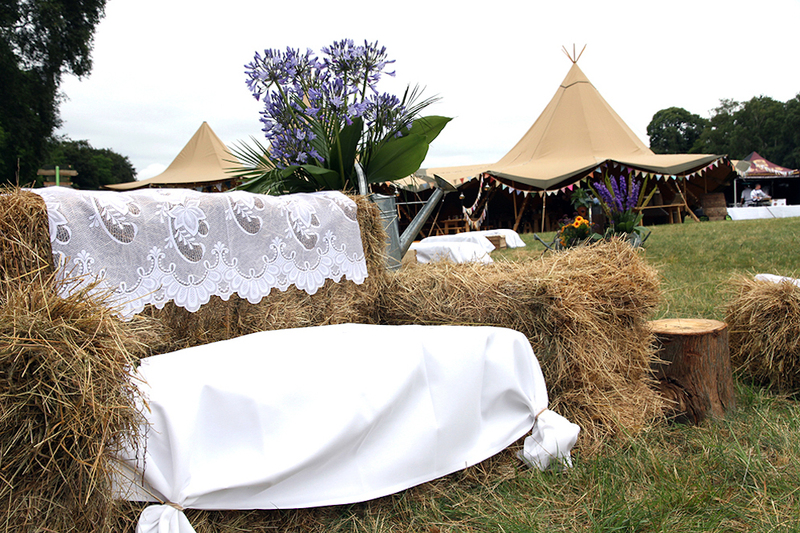 In some locations your tipi or marquee supplier may ask that the structure is not left unattended. How to Plan a Wedding in Six Months! Who wants to get married at The Copse?